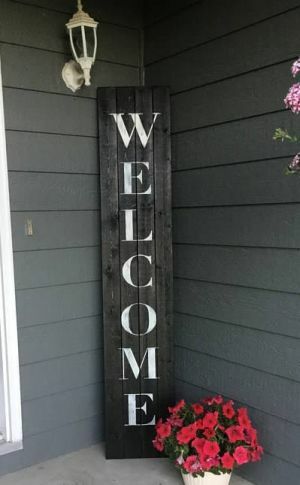 We will be doing a 6 ft porch leaning sign. 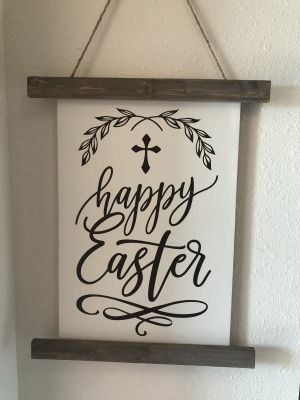 You can choose what you want your sign to say from Welcome to Happy Easter, or maybe a last name and est date. Please fill in what you would like for it to say in the form. You will create your own beautiful sign using a custom made stencil for a professional look. You will choose your background and lettering colors from provided paints. We will also teach you how to get a stained look without using stain. Cost is $45 and all supplies are included. Ticket sales CLOSE 2 DAYS PRIOR to the party to give us time to prep wood and cut custom stencils. Each friend signs up and pays for themselves before the party. What a beautiful way to decorate for Easter. 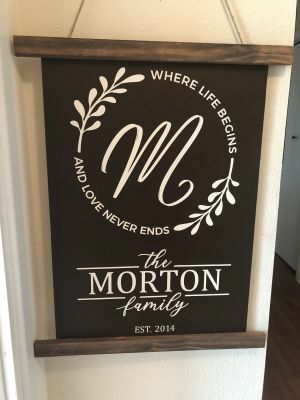 Create your own wood scroll sign and customize your colors to fit your decor. All items are provided along with detailed instructions. Sign is approx. 18x22" (not including hanger). Class price is $35 and space is very limited! 10) Just because there's no reason not to! Where life begins and love never ends. Finished sign is approx. 24" x 30" (not including hanger). All items needed will be provided, including a variety of paint colors to chose from. Ticket Sales CLOSE 5 DAYS PRIOR to private party to allow us time to prep materials and cut custom vinyl signs. Use this template for your public events where you collect a fee per person. For recurring classes adjust the time slots to make it a repeating event. For workshops, ensure that the time slot reflects the length of the workshop (ex. 6 hours).